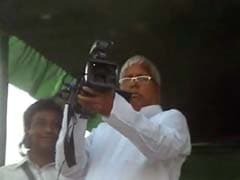 Jamui: Lalu Yadav, proficient giver of photo ops, proved he hasn't lost his PR touch yesterday. At an election rally, the 66-year-old, recently released from jail on corruption charges, took our camera, which was filming him, asked "Aye, tum sirf hamara shot kyon le raha hai, crowd ka shot lo! (Why are you shooting me, take shots of the crowd)" and then swung into action. He appropriated the camera, and turned it on the crowd, provoking cheers of support. Then Lalu turned to us and asked "Theek kiya na hum? (I did well, didn't I)?" Habib, our senior cameraperson at the Patna bureau, and I were headed to Jamui to cover the nomination of Chirag Paswan, the son of Ram Vilas Paswan who heads the regional party LJP. Jamui is a seat held by Chief Minister Nitish Kumar's party, the Janta Dal (United), and is likely to witness a triangular fight between Chirag, the JD(U) candidate and also the candidate from Lalu Yadav's RJD . We got to Jamui from Patna by 10.30 am and realised that Chirag's nomination would not happen before 1 pm. We were then told that Lalu Yadav was scheduled to address a public meeting just a few kilometres away. He was on stage when we reached there. Lalu spotted us. His first reaction was to break into a big smile. And then, his famed antics started. He first roared to the crowd, "Dekho dekho NDTV aa gaya (NDTV has arrived)", and then looked at us, and shouted into the mike "Aye NDTV , neeche kya kar rahe ho, stage pe aao (come up onto the stage)!" We obeyed. And that's when he took over as cameraman.